Israel's attorney general says he is taking steps to indict Israeli Prime Minister Benjamin Netanyahu, shown here earlier this month, on corruption charges. The announcement shakes up Israeli politics just six weeks before voters decide whether Netanyahu gets another term. He has been serving as prime minister for a decade. Mandelblit has been studying three different corruption cases and has outlined them in a document over 50 pages long sent to Netanyahu's lawyers, Israeli media reports. The details of the accusations are well-known. Israeli police recommended months ago that Netanyahu be indicted for all three sets of allegations. First, he's facing a possible breach of trust and fraud charges— for accepting cigars and champagne and expensive gifts from wealthy businessmen, including Hollywood producer Arnon Milchan. Second, he's facing more possible breach of trust and fraud charges charge — for trying to strike a deal with a newspaper publisher to advance legislation to help the publisher's business, in exchange for giving Netanyahu positive media coverage. The deal never went through. The final case is the most serious one because the charges the attorney general is considering include bribery. 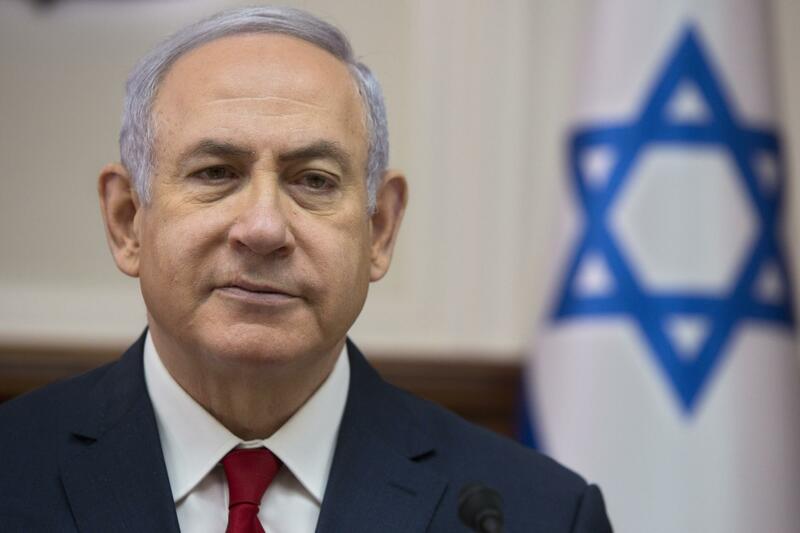 Netanyahu allegedly approved a lucrative company merger for a telecoms businessman, and in exchange the businessman's news website gave Netanyahu favorable coverage. Though Netanyahu will receive a hearing prior to a formal indictment, the authority will remain with the attorney general to decide. A final indictment could take a year or more. The hearing date has not yet been made public. Netanyahu has called the bribery charge "absurd." He's decried the probe as interference in the upcoming Israeli elections, and described the accusations as a "house of cards." He's accused Mandelblit of caving to pressure from the left and the left-wing media to rush to announce charges before the elections. The embattled prime minister is expected to address the Israeli public on Thursday evening. This saga has divided voters. A recent poll from Haifa University shows about half of the public doesn't have much trust in the attorney general. At the same time, another poll from the Israeli television show Meet the Press said that 64 percent of Israelis wanted Mandelblit to announce his decision prior to the election, Haaretz reported. The Justice Ministry said in a statement that "the Attorney General has reached his decision after thoroughly examining the evidence collected during the investigations conducted by the Israel Police and the Israel Securities Authority, and after considering the detailed opinions provided by the State Attorney's Office. Furthermore, the Attorney General has conducted a series of lengthy discussions with senior members of the State Attorney's Office and the Office of the Attorney General." Netanyahu has signaled that if indicted, he would remain in office and fight in court. The non-partisan Israel Democracy Institute called on Netanyahu to "carefully consider" what's best for Israel. "Is it best for the country to be governed by a leader charged with serious criminal acts of corruption, or is it best for him to resign and focus on proving his innocence in the courts?" the institute said in a statement. It warned about the "serious potential damage to the public's trust in the state's institutions caused by a situation in which the government is headed by an individual charged with criminal misconduct involving abuse of power." In the upcoming vote, his base will still likely support him — indeed, in a Haifa University survey, 65 percent of his party's supporters said they believe law enforcement is trying to force Netanyahu out. That party, Likud, said Thursday that this announcement represented a "political witch hunt" aiming at toppling Netanyahu's government. Other voters, though, may question his ability to lead the country amid an uncertain political future as he faces these charges. Netanyahu has been the front-runner in the upcoming elections, but if his poll numbers slip — even slightly — it could tip the scales. He would need to build a governing coalition with other parties in order to stay in power, and with likely criminal charges hanging over his head, it's unclear if other parties will be willing to stay by his side. There's also a new centrist list led by a former army general – who is strong in the polls and who could win instead. Israel's attorney general is taking steps to indict Prime Minister Benjamin Netanyahu on corruption charges. Netanyahu has a chance to respond to the allegations in court, which could take months, before an actual indictment is filed. But this has jolted Israel just six weeks before an election in which Netanyahu is seeking another term. NPR's Daniel Estrin joins us now from Jerusalem. Hi, Daniel. SHAPIRO: OK, I described these as corruption charges. What exactly is the attorney general accusing Netanyahu of having done? ESTRIN: Well, there are three separate cases here. They all involve Netanyahu's relationships with businessmen. The attorney general says Netanyahu did favors for a Hollywood producer and received a, quote, "frequent and continuous supply of gifts." The attorney general also said Netanyahu is suspected of discussing a potential deal with a newspaper publisher to help him undercut his competitor in exchange for positive press. And then there's another allegation. Probably the most serious one is that Netanyahu used his authorities to give lucrative favors to a powerful businessman. In exchange, the businessman's news website gave Netanyahu favorable media coverage. So now Netanyahu gets a hearing in court. He's going to try to convince the attorney general not to press these charges. But I spoke to legal experts who say criminal charges are pretty much a given here. SHAPIRO: We've been getting regular news updates on this investigation. Is this move towards an indictment a surprise? ESTRIN: Right. No, we've known about this for a while now. The police have investigated, and now the attorney general has deliberated for months. And he's given his answer today. SHAPIRO: And what's Netanyahu saying in response today? ESTRIN: Well, he spoke in Hebrew. And you can hear him say the word fake over and over. Have a listen to this. PRIME MINISTER BENJAMIN NETANYAHU: (Speaking Hebrew). ESTRIN: ...To discredit investigations he's facing. And Netanyahu says this is a blatant interference in upcoming elections for the attorney general to rush to announce this before the elections. Basically his message is the same message we've been hearing Netanyahu say for months, which is, the left wing is trying to topple me. SHAPIRO: Interesting to hear him take a page from Donald Trump's playbook there. Well, what is the opposition saying about this as the elections approach? ESTRIN: Well, his main centrist challenger, who is an army chief - a former army chief who used to serve under Netanyahu - he gave a speech right after Netanyahu did, and he called on him to stop attacking the justice system, to put the country's interests over his own personal interests. He said, you know, Netanyahu can't handle the affairs of a state while also fighting in court. And he called on Netanyahu to step down. SHAPIRO: What are the chances of Netanyahu doing that? ESTRIN: Well, Netanyahu vows to stay in power for many years to come. That's what he said tonight. And by law, he does not need to resign. He could fight his case in court and still remain in office. And that whole process could take years. But I must say that today his future looks a lot more uncertain than it's ever looked over the last 10 years that Netanyahu has been in power. This is going to be a very close election. He's neck and neck with his centrist challenger. Most of his right-wing political allies say that they will support him for re-election, so there's a good chance he will stay in power. The big question here is, once he is likely indicted, whether Netanyahu's political partners will stay by his side and keep him in power. SHAPIRO: It's NPR's Daniel Estrin speaking with us from Jerusalem. Thank you, Daniel. ESTRIN: You're welcome. Transcript provided by NPR, Copyright NPR.